Where to sail near Melbourne in an E - SE wind? So Tues is looking like it's going to be windy, forecast 20 - 30 knots all day. Do any of the spots down the coast like 13th work on an E - SE wind? Where would be the best place to make the most of what could be an epic day? Ricketts Point, Beaumaris Life Saving Club. There are reefs so you need to ask somebody before going out. I going down to Inverloch early morning flat water sailing in the inlet, Mahers Landing. Low tide mid morning, will be epic for sure. Then if I still got legs left I may finish off nicely at Ricketts or Mentone. I was hoping for some waves. Looking at the map 13th Beach looks like it might work on an easterly, but I think I've only heard of people sailing there on a westerly. Raffs looks like it would be a bit onshore. Sandy Point perhaps a bit too far to drive. There's waves at Inverloch too. I'll be out there after work this arvo - probably 4ish. Seems like you're looking West coast mainly though, if thats the case join the Surf Coast Frothers facebook group. Dave & the other west coast crew are always posting where they're sailing on each wind forecast. 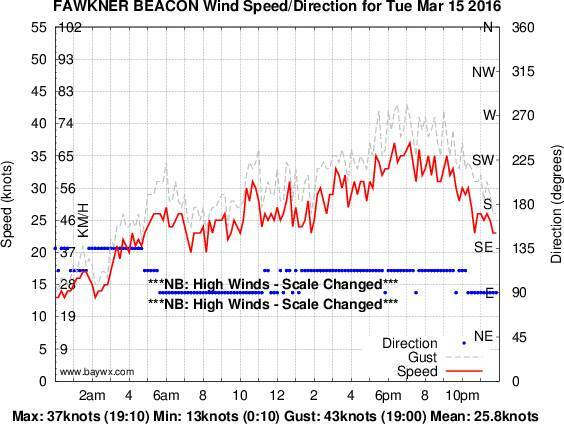 35 knots at Fawkner Beacon when I was down at Ricketts from 6pm-7:30pm last night. Possibly the windiest conditions I've ever sailed in. Totally overpowered on a 4.0 most of the time, but fantastically steep ramps and plenty of speed to launch, on the occasions I had enough control and bravery to jump. = Salt & Vinegar after you have left it soak for some time. if that fails and all seems lost, just get a pen and poke the zip teeth to pry them apart so you can at least get to your sail without un-stitching cutting etc. If you get it moving again the carriage may still work if its not too corroded. Don't let a zip stand in the way of a good session!!! Thanks for the advice and reports, I'll check out the FB group and give Ricketts a go on the next strong E/SE, I thought it was flat water sailing on that direction. Soaked it in vinegar, boiled the kettle and had tea with salt on my chips. Finally got the basrad open, where'd the wind go?